It’s easy to become distracted by irrelevant information–whether you’re sidetracking yourself, or your opponent is barraging you with facts and figures that simply don’t matter. It takes practice, but a skilled arguer can learn to move past extraneous points, without getting pulled into time-wasting tangents. Don’t allow yourself to become overwhelmed by the multitude of information that may be hiding the important parts of an argument. Find out early on what matters most about your argument, and don’t let anything distract you from those key points as you build and argue your case. Don’t be distracted, discouraged or persuaded by the infinite number of things that simply don’t matter. 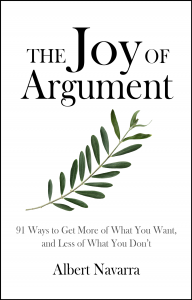 If you’re interested in learning more about using argument, check out The Joy of Argument here.